We try to get to the root cause of your spine conditions. Troubled by your back or neck? The spinal disc acts as a strong elastic pivot for each joint segment of the spine. It provides overall stability and allows a relatively wide range of motion in all directions in the neck and the lower back. When a disc starts to lose its strength, it can cause a range of painful symptoms such as pain in the neck, shoulder, arm (and possibly into the hand); when disc breaks down in the lower spine, it can lead to lower back pain, leg pain and other symptoms such as numbness and weakness. These problems could be due to several reasons. It could be due to age and deficiency of Vitamin D and Vitamin B12. Further, if you sit for long hours, you may experience problems in the spine. Another common cause for spine problem is weight gain and lack of exercise. At Sportsmed, we believe that listening is very important. We listen to our patients, note their symptoms and take into account associated conditions; it could be one of the many problems such as pinched nerve, degenerated disc, slipped disc, herniated disc, bulging disc and so on. 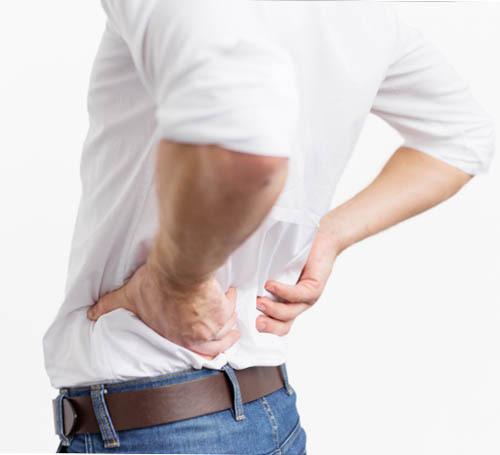 We then look, feel and move & carry out any special clinical tests; this gives us a better understanding of the problem (whether it is a Degenerative Disc problem or a Herniated Disc problem). After physical examination, we investigate with the help of appropriate imaging techniques. Our old-school approach combined with new-age technical skills help us design an optimal treatment plan for our patients. When you visit Sportsmed, we first delve in to the onset, progression and extent of disability before recommending suitable treatment. Our investigations begin with a basic X-ray (unlike many places where an expensive MRI scan is recommended). In most cases, investigation does not have to go beyond an X-ray; an MRI is definitely not our first option. When we feel the need, we do not hesitate to take the opinion of another colleague at Sportsmed or request for a second opinion elsewhere. If the opinion is sought within Sportsmed, we ensure that our patients aren't burdened with the cost of second consultation. While we are seasoned surgeons, about 80% of our patients receive a non-surgical treatment. We also do not believe in prescribing medicines & drugging patients; we prefer to recommend life style changes & exercise therapy for recovery. Treatments for spine varies from patient to patient. It is solely dependent on your condition, symptoms and what exactly is causing the problem. We give tips on exercise modification and advocate a holistic approach to handle your spine related issues; treatments include therapy and lifestyle changes, injections, surgery and alternative medicine. Lifestyle changes are extremely helpful; young fitness freaks are advised to avoid certain high impact exercises, maintaining correct posture, wearing appropriate footwear, and more. Office goers who sit for hours together are advised to go for standing workstations. For those who are aging and their nerves are trapped in the spine because of wear and tear, we recommend walking distance reduction. Your doctor can help you identify a variety of lifestyle changes that promise better spine health. Additionally, we recommend physical therapy for strengthening the muscles and enhancing joint stability. A vast majority of our patients have tremendously benefited from physical therapy alone. At times, you may be recommended pain blockers and injections. A few that we use include Epidural steroid injection, Selective nerve root block (SNRB), Facet joint block, Facet rhizotomy and Sacroiliac joint block. However, we use them very sparingly. With the use of pain blockers, your pain could ease out for a few days or months (depending on your condition and the pain blocker recommended to you). Usually pain blockers tend to work better with younger people. To ensure that the injected substance reaches the exact problem area they are administered by our specially trained musculoskeletal radiologist, under ultrasound or CT guidance. When deciding on a treatment option for pain caused by a disc problem, it is important to consider the type of surgery before deciding whether or not to have surgery. At Sportsmed, we helps you understand pros and cons of the surgical procedure and nonsurgical rehabilitation. Also, there is an optimal time for every surgical procedure; some have to be carried out early and others can be planned. The typical surgery to address radiating leg pain for a herniated disc is a microdiscectomy, a surgery with a high success rate in immediately relieving the leg pain with a relatively short recovery time. The typical surgery to address lumbar degenerative disc disease is a lumbar spinal fusion, which has less reliable outcomes and a longer recovery time. Further, within types of surgery, there are many considerations. For example, a multilevel fusion of any type will take longer to heal and will cause more stress to be relayed to the other non-fused spinal segments than a one level fusion. Multilevel fusions (such as L4 – S1) therefore deserve more cautious consideration than a one-level fusion (such as an L5-S1 or an L4-L5 fusion). Given the many considerations involved, patients are well served to become as educated as possible about their surgical options before making any decisions.